A celebration of life event has been set to remember Sherman Halsey. As previously reported, Halsey passed away Oct. 29, 2013 at his home in Nashville at age 56. 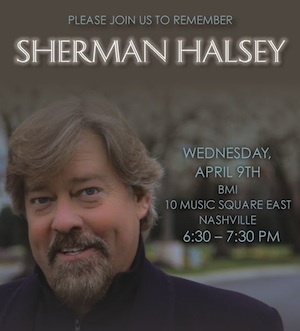 The event will be held Wednesday, April 9 at BMI’s Nashville office, located at 10 Music Square East. The event will take place from 6:30-7:30 p.m.
Halsey was the Vice Chairman of the Jim Halsey Co. from 1980-1990, representing nearly 50 Country artists, and with his father, also headed the MCA/Churchill Record Co. Halsey produced and directed hundreds of television shows, and was represented by Tacklebox Films. Halsey helped create more than 30 videos for Tim McGraw, including the clips for “Indian Outlaw,” “One of Those Nights,” “When The Stars Go Blue,” “My Little Girl,” “Live Like You Were Dying” and “She’s My Kind of Rain.” Halsey also helmed many of Dwight Yoakam‘s early videos, including “Little Sister,” “Guitars, Cadillacs,” and “Honky Tonk Man,” which earned the distinction of being the first Country music video to be played on MTV. Other artists Halsey worked with include the Oak Ridge Boys, Alan Jackson, Brooks & Dunn and Lorrie Morgan. Any photos that industry members, colleagues and friends have taken with Sherman can be sent to Gina Halsey by Friday, April 4.